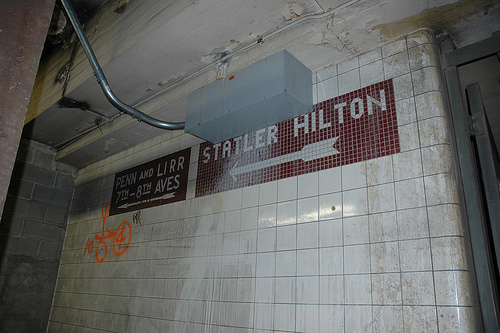 Many people have wondered about an old passageway that used to connect 6th Avenue near the PATH 33rd Street terminal area, to Penn Station. The passage was closed in the 1980's due to the homeless and crime, and sat gated off for years. When the area was refurbished in 1992, I hoped that as new life was coming to the formeryly drab gloomy surroundings with the mall opening and all, that the passage would be given a new life and included as well. But instead, it was walled off, removing almost any trace of its existence. The other side was closed off by a huge slam gate that was as wide as the passage. But then when that side of it was refurbished as part of the Penn Station Concourse and IRT 7th Avenue line project years later, this gate too was replaced by a wall with a regular size door. So on transit related discussion boards, questions would frequently come up as to where this passage was. However, since I saw exactly where it was, and even saw the walls going up; I mapped it out for all to see, and described what to look for. (Many people were also thrown off by a boarded up doorway to the right of the area on the 6th Ave. side, but this was to an old exit to the street. This has since been removed. Others think the passage was under 32nd St. This may be from remebering walking through the passage, and then using a 32nd St. exit from the uptown 7th Ave. platform, and forgetting the exit they used was not where the passage was). And now, with my finally getting a camera phone, I took pictures of the area as well. 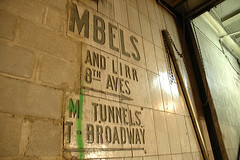 The problem with the passage is a dispute over who owns it: Gimbels (originally) and its successor, the Manhattan Mall, or the city/MTA, or even thre Pennsylvania Railroad and its successor Amtrak as I see one document says. Whoever does; none of them want to be bothered with it. [Now one owner, see below!] The stigma of the homeless still lingers, and you do get homeless camping in the area on both sides. I had drawn out an idea to bring the area into fare control, in which they would be kept out. 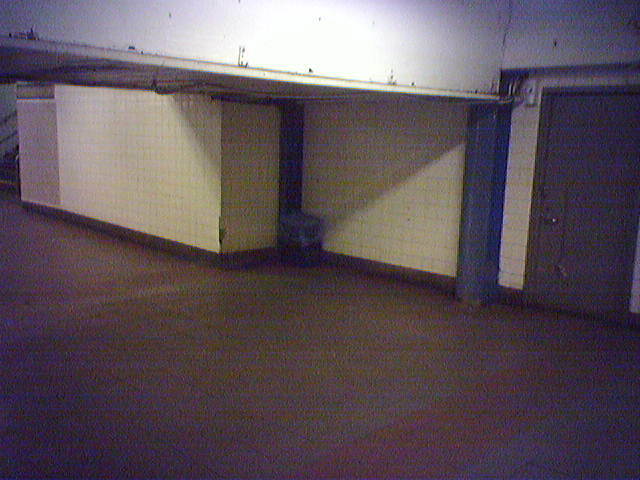 At one point it involved the "shortcut" passage from the mall entrance area to the stair down to the 6th Avenue fare control area, but this has since been filled in by two newsstands on either end sharing a common stockroom in the middle. Another idea I had was a moving sidewalk, like the ones at airports (and also at the Jamaica LIRR station overpass constructed to connect to the AirTrain station), and in the long passage between the G and E/V trains at Court Square. 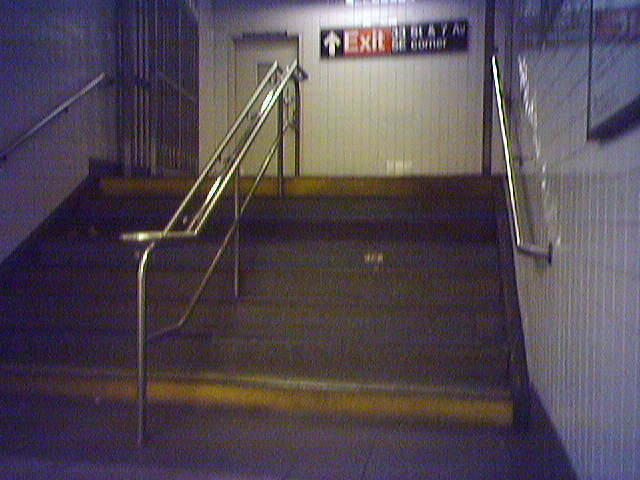 A nice new outside-of-fare-control passage was constructed by joining hallways in the basements of 1251 Avenue of the Americas and the new 745 7th Avenue; thus creating a connection from the uptown platform of the 49th St. station of the Broadway line with 6th Avenue and the rest of the Rockefeller Center concourse. As desolate as this passage usually is (which is not even straight), there is no problem of the homeless (it is even lined with glass showcases); as it is watched by guards at the entrances to the offices and other businesses along the way. In that case, the trick would be to convince Manhattan Mall to maintain this passage like this. (For one thing, perhaps they would have to do what the zombies who take over the malls on the Mall Tycoon game say: "GET MORE MALL COPS!!!") It would be very beneficial to them to have a convenient indoor connection from Penn Station and its busy concourse, to the mall. Having to go up to the street (esp. in bad weather) has probably made the difference in many a shopper catching a train or event at MSG or something, between going to the Mall, or skipping it and remaining on that side. Perhaps don't reconnect it all the way to the PATH area, (since the mall entrances lead to it), but instead connect it to the service corridor behind the stores on that side on that level, which lets out into the mall between the current Strawberry and Oasis stores. 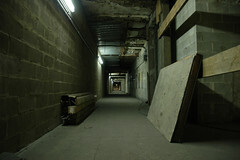 (This section of the corridor would be opened to the public, of course. 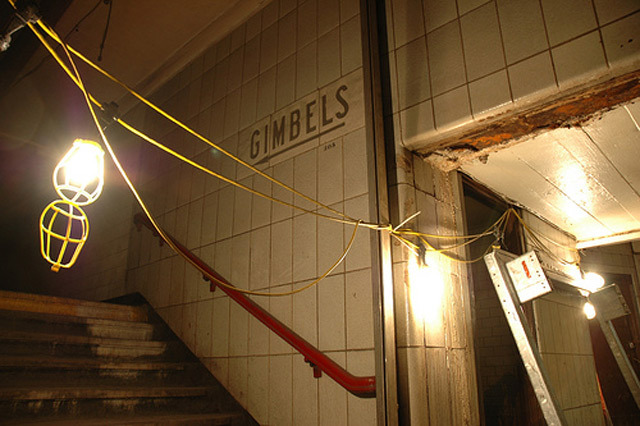 This should be easy to do, as the passage would be right on the other side of that wall, and Gimbels', IIRC, may have had entrances and/or windows into the passage anyway). 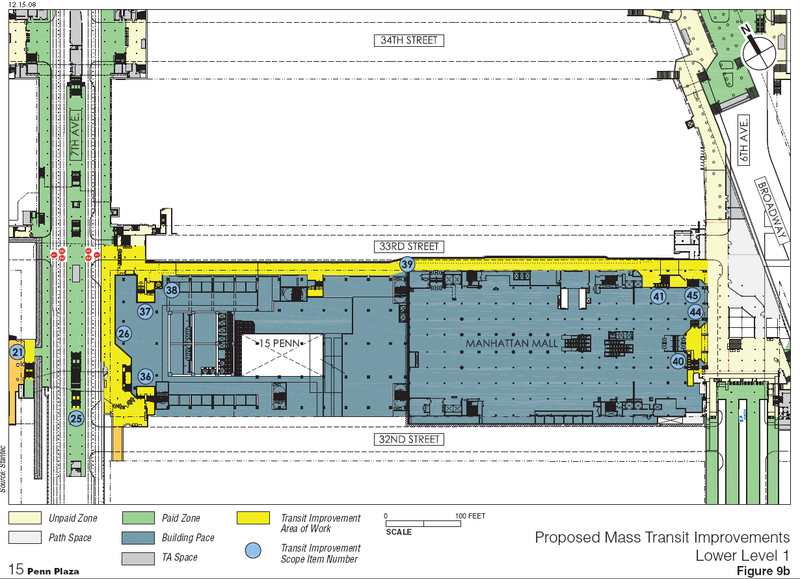 The other much inquired about but sealed up passage in this area (connecting the north end of the 6th Ave. station complex with the south end of the 42nd. St. station) is not as useful, since you had the subway running right under it. This one connecting PATH and the Mall with Penn station would be very nice, especially with how nicely the areas on both ends have been done. 6th Avenue side of passage. Not sure whether door leads to it. (picture below strongly suggests it does!) Right on the narrow "shadowed" wall facing; the full width from the corner to the side wall is the dark gap with the ceiling. When looking with your own eyes at a particular angle, a lit section of the wall tiles inside is clearly visible. Here is a view directly into the passage right through the gap between the wall and ceiling. This is at the top of the steps at the beginning of the passage. 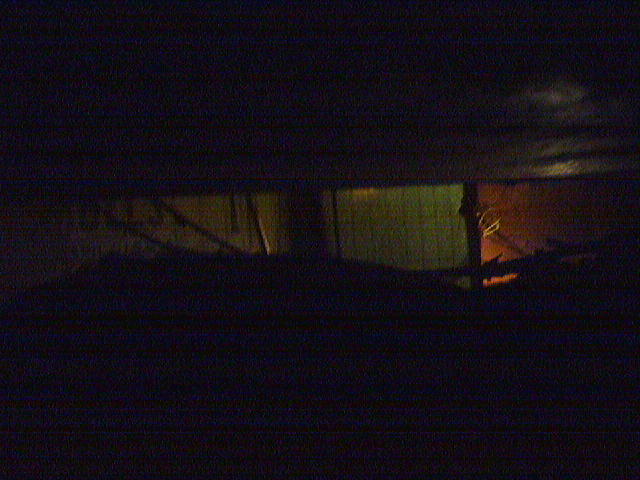 Other end at 7th Avenue. In this picture, we see the hollow space, to the right of the stair, which is apparently at point #1. That is probably where the door on the 6th Ave. side leads to. 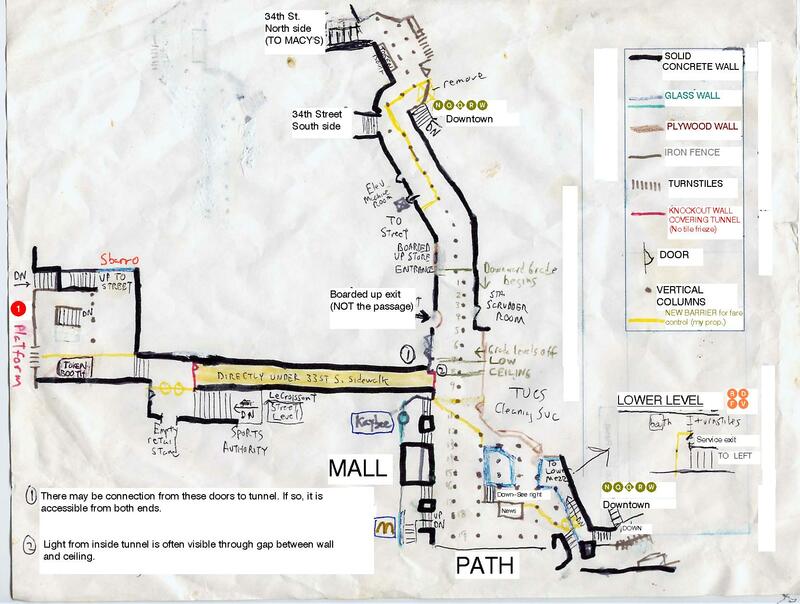 According to the person, the tunnel from the 6th Ave. side is only about as long as the mall, then there is a concrete wall. The new wall on the left side of the picture looking down the passage was built when the utility tunnel of the mall was constructed. There is even a door in this wall leading to it. The 7th Ave. side would then have belonged to the Hotel Pennsylvania, which is scheduled to be replaced by a new building. It is not known what this will mean for the tunnel. However, Vornado Realty owns the whole block now (the mall and the hotel site), and thus will have complete control over the tunnel. Perhaps they will see the value in having the connection for the tenants to Penn Station, and be willng to provide the maintenance and security for it. (I even wrote them with the suggestion soon after they took over). 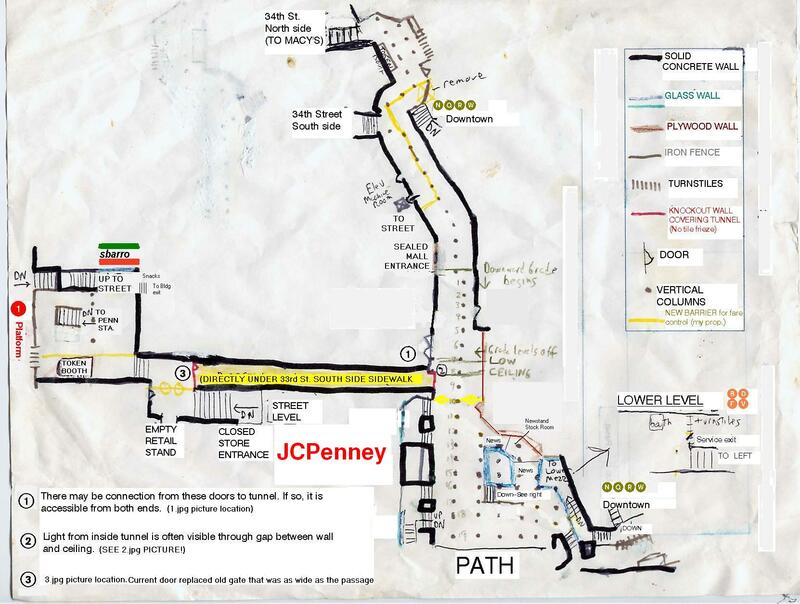 Likewise, JC Penney also recently took over the lower 3 floors of the mall, and thus has complete/sole access to the service and utility areas leading to the passage. They as well might see the usefulness of it. It will help them compete with K-Mart, which is right in the Penn concourse. A picture from another person, from inside the 7th Avenue end, behind the door at point #3. The wall is charred from the smoke of a fire that occured in a room right before they replaced the gate with the wall and door. Now if we could only get the new passage on 42nd from 6th to 7th opened. It was to be part of the new Bank of America tower, which has recently been completed, and while you can see the beginning of the passage from the northern 6th ave mezzanine (next to the stair to the street, behind the iron fencing with plywood and a door and false concrete block wall), it seems the other side of it is not ready. (Not sure where exactly it was to come out anyway. I imagine, on the far side shuttle platform where there used to be an exit to the old building). A mid block entrance to the passage from the new through block arcade appeared to be constructed, but is now covered by a wooden platform that serves as a bench. Where it is widest, nearest 42nd St. would be where the I saw a stairway being built earlier on. When we get both of these passages, if they then reopened the one under 6th from 35th to 40th, we would then have a sizeable connected undergound passageway system in midtown!